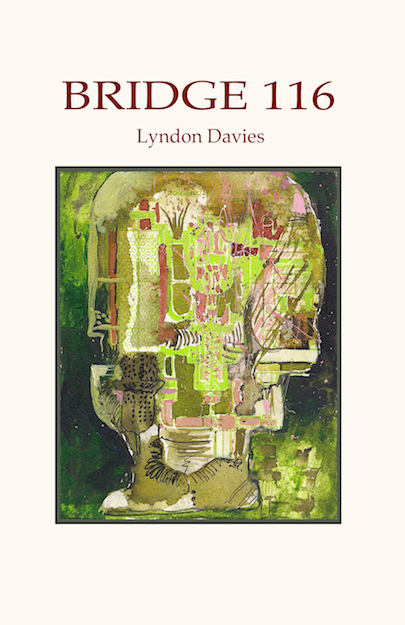 Lyndon Davies’ fourth collection takes a high-dive into the vast but weirdly personal and particular mysteries of place and belonging. Shifting through forms, registers and perspectives, part journal, part improvisation, part hallucination, Bridge 116 explores a vision of locality both specific and haunted by many kinds of news from elsewhere. “This is a great book, Davies’ finest to date. There are some amazing oblique and direct treatments of, and meditations on, ‘place and belonging’ as the blurb has it (e.g. ‘The Black Bog’, ‘The Rising of the Usk’), plus a plentiful variety of forms, and no shortage of subtle (but often killer) wit. There’s lyric music here (‘Her Gaze’), beautifully-pitched performance/chant pieces (‘Dada Yodel’), nicely modulated prose slabs (‘Remembrance Day’), a ballad even, a haunting sequence (‘Little Songs for a Journey’), and more – and all beautifully interweaved by naggy-soothing little leitmotifs – bridges, Nadja, the bruised thumb / poisoned tooth, nymphs / sirens, those red-in-tooth-and-claw insects eviscerating each other in the garden, Albert Alyler the legendary jazzer (‘Under the Williamsburg bridge coule la Seine’ – what a line, quel vers!). I say it again, this is such a GREAT BOOK. This is a poet ‘mischievous and precise / [an] elegant and voracious worker in the holds / of space’, and if there were any justice in this world Bridge 116 would win a brace of prizes and be a Poetry Book Society Choice or something. But there isn’t, so all I can do is urge everyone who sees this to buy the bugger and read it, and re-read it, and discover what poetry can still do (‘honey for infection’) that nothing else can, in these distressed times.” John Goodby.